Your success in a hunting spree depends heavily on the vision. The clearer you see, the better shot you have at the target. Chances are high that a person with a high-quality scope and a mediocre gun will outperform a person with a superior gun and a sloppy scope. Therefore, it’s very crucial that you choose a scope that will help you get a clear aim at your target. There are many pro shooters who swear by the performance of Vortex gears and they are one of the most highly trusted names when it comes about riflescopes. It offers incredible performance in terms of clarity, durability, stability and many more. There are countless riflescopes available in the market. However, the Vortex Crossfire II will amaze you with its awesome features on the very first go. This scope is suitable for shooter and hunters who want their scope to deliver the highest level of accuracy and reliability. It’s suitable for all kind of shooters regardless of their skill level. Be a beginner or a skilled hunter, you can rock this scope easily. The design of the Vortex Crossfire II is simple yet sturdy. It’s made with a lightweight metal alloy which offers extreme durability. The matte black anodized finish gives it quite a sturdy look. It’s suitable for all kind of weather conditions and its robust build quality enables it to endure even the most extreme weather condition like a breeze. The Crossfire II has fog-resistant, water-resistant and shock-resistance properties. It also has O-ring seals that offer protection against dust and debris. The nitrogen gas filling ensures that there is no fogging inside the glass. It has an allover rubber body that helps with grip and gives it strong external protection. The Vortex Crossfire II has a weight of 1 pound only which makes an incredible choice to be equipped on a riflescope. Even though it weighs super light but it does not compromise to its sturdiness. It has 1″ tube that’s designed to fit most mounts, rings, and bases. Also, the entire tube is crafted from a single piece that results in better lens alignment and power. The lens of the Crossfire II is multi-coated with anti-reflection coatings. It has multiple layers on all surfaces that offers improved light transmission in all brightness settings. It provides accurate vision from dawn to dusk. So, if you’re a nocturnal hunter, you may have found your match made in heaven. Also, overpowering sunlight would not be an issue to have a clear view at your target when you have this scope equipped. Parallax errors are a common issue with riflescopes. A parallax error is when the target is shown to be placed slightly on the left or right side of its actual position. However, the Vortex Crossfire II precisely eliminates this error and helps you with an accurate shot at the target. The reticle of the Vortex Crossfire II is placed on the second focal plane. It has an illuminated center dot. The reticle is suitable for hunting for both day and nighttime. However, it’s not an appropriate match to be used for sport or tactical shooting. The illumination control system is located on the top part of the scope. It incorporates V-Plex reticle which is an all-purpose dual reticle. The V-Plex tags along with battery power to illuminate the center dot even in low light conditions. The Vortex Crossfire II is equipped with capped turrets. The capping of the adjustment knobs reduces the damage that might arise due to physical impact. Each click on the knob results to a shift of 1/4 MOA. Vortex is very generous when it comes about the warranty. They will not ask for any money receipt or proof of ownership as they offer an unlimited warranty on their scopes. You’ll get a full refund or a replacement if you face any difficulty with your product or if you receive a faulty one. Is this scope compatible with AR-15? Ans: The Vortex Crossfire II has shown extreme precision and accuracy when mounted on an AR-15. Will they refund if I get a faulty product? Ans: This scope offers an unconditional lifetime warranty so you’ll get a refund or a replacement without being asked any sort of questions. What kind of battery does this scope have? Ans: It comes with a single CR 232 battery which offers 1000 hours on the lowest setting and 25 hours on the brightest setting. To sum up, the Vortex Crossfire is great riflescope and it’s as good as it gets on a mid-range budget. It offers a lot more features than its predecessors and it’s an ideal model for hunters of skill levels. On top of that, it comes with an incredible price-tag that’s hard to beat. 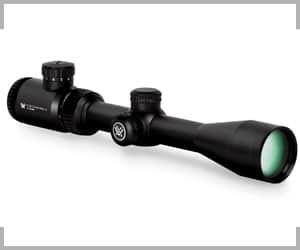 Overall, it’s an outstanding riflescope with an excellent price to performance ratio.